6sqft’s series The Urban Lens invites photographers to share work exploring a theme or a place within New York City. In this installment, Jeffrey Milstein shares his amazing aerial photos. Are you a photographer who’d like to see your work featured on The Urban Lens? Get in touch with us at [email protected]. In New York, it’s typical for tourists to look up and ogle the skyscrapers, while locals generally walk head down towards the pavement. So who then, is stereotyped as looking down upon the city from above? Gods, pilots, and photographers are among the limited answer options, and Jeffrey Milstein checks two of these boxes. He’s extensively photographed both aerial shots of cities and the aircrafts that allow him to do so. Milstein’s series of NYC photos, “Leaning Out,” makes the city out to be more pattern than people. From his height, New York becomes a series of shapes, some quickly recognizable – the leafy expanse of Central Park, the top of a Macy’s Day float – others less so – the cheery tops of Coney Island’s amusements, the map-like expanse of the American Museum of Natural History. 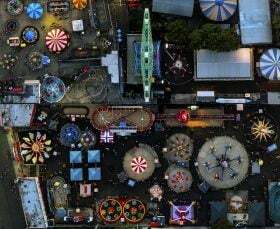 6sqft got a chance to chat with Milstein about the surreal experience of capturing New York from the sky and his new exhibit at the Benrubi Gallery, which features his aerial shots of both New York and LA and opens tonight.